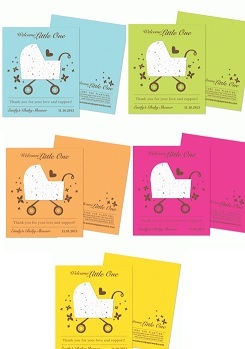 Share the news of the new addition to your family with these baby carriage plantable favors. Available in a variety of vibrant colors, these favors grow into wildflowers when planted. These creative baby carriage plantable favors will then provide not only a bouquet of beautiful blooms, but a lasting memory of your wonderful occasion. The baby carriage shape is created using plantable paper, and post-consumer materials, so it leaves no waste behind.